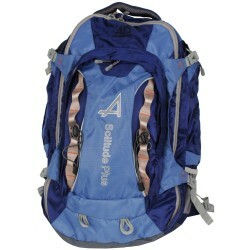 The redesigned Solitude Plus continues to be a favorite pack among many. The outside zippered pockets lower side neoprene pockets main pocket and front pocket give you plenty of storage to organize your gear. There is also space between the outside zippered pockets and the main body of the pack to slide even more gear such as a tripod or additional water bottles. The Solitude Plus is a great pack to bring along whether you're going on a day hike or traveling through the airport and need a carry on pack. The quality and features found in the Solitude Plus are top-of-the-line!